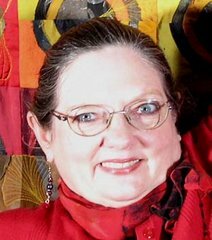 Rebel Quilter: Time and waiting = Inspiration! Time and waiting = Inspiration! I've discovered that waiting and I don't make good company. We have the house all prepped for the market and now it feels like "all dressed up and no place to go". But we DOOOOO have someplace to go. We want to be with our children and grandchildren. They are in the eastern time zone and we're in central. Fifteen years ago we moved to the Ozarks because we were pretty sure my parents were going to need our help and living in Clearwater, FL involved a 2 day drive or a 2 hour flight. So here we are. My dad passed 7 years ago and Mom lives with us and Jon and I share fulltime caregiving. She is quite frail, terrified of falling and is doing a pretty good impression of "bump on a log." A while ago, on her 85th birthday, I asked her about being 85. At first she was pretty sure she had no idea as she was quite certain she couldn't possibly be that old. When I asked her what she thought 85 looked like she simply said, "slow." Boy! she nailed that! Every time I see a video with a sloth in motion I just think...moves faster than Mom. So now we are at what, to me, has become the hardest part of the move--waiting for the house to sell. If there was traffic and it got shown occasionally, I'd at least have areas to focus on and fix/ ignore. But hurry up and wait just doesn't suit my cup of tea. I've been finding myself going through periods of anger, frustration, listlessness, etc. Not good for me nor those around me. So I've decided that I need to direct my attention on an art project. My first in 3 years. I am addressing the issue of time and waiting. Despite having packed up my studio, I do have access to a few materials. I don't think I could easily dye any new yardage without unpacking a bunch but my ability to add surface design is still pretty much intact. I could draw, paint, felt, embroider, cut with scissors, almost unlimited in my direction. But where to start? When I started thinking about time I conjured up images of hour glasses, clocks etc, first. Then I started thinking about waiting and how that is related to time. The tide goes in, the tide goes out. The stars move on relentlessly along with the seasons. There are periods of waiting while germination occurs. What is happening during that period? Where does germination begin? Where does gestation begin? No, I do not want to get into religious thoughts regarding the beginning of life!!! Today is the equinox- equal parts day and night. How appropriate!!!! Today the balance shifts to longer nights. I find I am compelled to reach outside my own head and thoughts and include the impressions of others. I want to know how time and waiting affect YOU. Is your job affected by time? Do you have periods of waiting? How do you approach that aspect? Have you had a major experience that involved time? What happened? Seriously-- I want to hear from you on the comments section or email me directly. In the past it seemed like the longest period of waiting for me was from the point I sent in an entry for an art show and had to await the jurying. So time also had the element of judgement attached. How often does waiting involve judgement? I know there are periods that time seems to go into a time warp. Those periods are, for me, most often associated with a "maybe". That is a point where a decision has not been reached and things are in a quandary. Around our house that was declared as "living in parenthesis". Not my idea of a good time. An example might be a period of deciding IF you are going to make a big change. Once the change is decided, things usually resume to normal speed...or perhaps speed up! Time seemed to move pretty fast while we were doing the remodel. But here, the decision is done, the preparation is done and now we await the physical universe catching up to provide that person that falls in love with our house the way we did and can make the move. We know that person/people is out there and seeking just such an escape from the big city to a slower lifestyle and one of the lowest crime levels in the country, where the air is clear, the people genuine, rivers and lakes abound and living is good (as long as you are not dependent on the local economy for your income.) An IT person would love it. BTW, I am including a link to our house listing on Trulia . 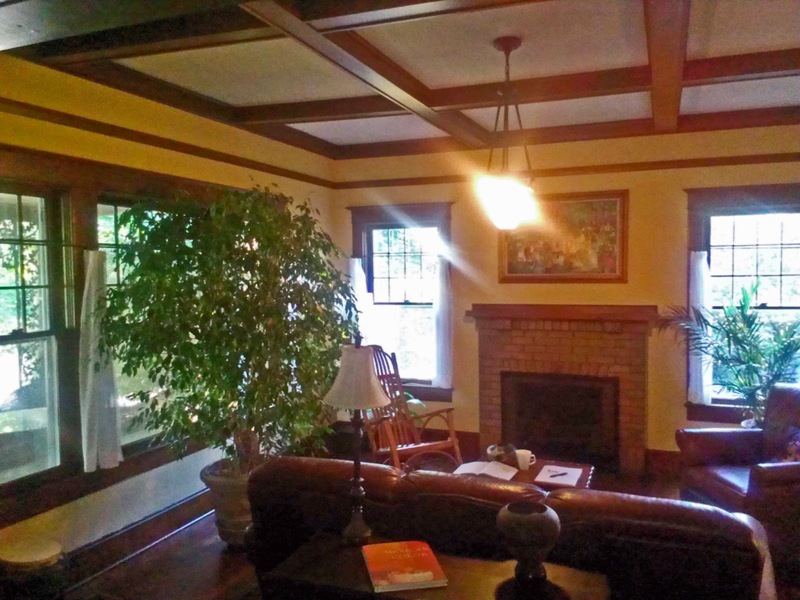 We live in a classic Craftsman style home in a charming small town in the Ozarks. The house is wonderful and if there was any possible way to pick it up and take it with us, we would. If this home were in a larger town of any consequence it would be at least double the price. So please help us spread the word to anyone you know who might be looking. Now back to the subject at hand... I await your input...with impatience. Start. Please feel free to add your thoughts via the comments section or via email to me. susan@rebelquilter.com. Thank you. First - I am just superstitious enough to think that if you pulled out lots of fabric and made a great big mess, the house would get shown and sell. Second - most of what you have talked about is frustration about time and waiting but sometimes it's the reverse and time passes so quickly one can't keep up. Like the house finally selling, packing, moving, finding another house, and settling in. The time will fly.